Lower Pricing: With standardization, you know the top manufacturer brands you intend to purchase over the next 5-10 years. This makes it easier to get contract pricing that saves you money. Better Space Usage: Any new leased or built space can be designed around the type of office furniture that will be installed, ensuring less wasted or “shadow” space. Higher Asset Reutilization: When you have a protocol in place for inventorying and tracking each piece of office furniture, you can ensure that you don’t buy new when an item sitting in storage could be used instead. Faster Provisioning: Whether you are buying new and need speedy delivery or relocating furniture from one site to another, a standards program gives you an edge in outfitting the workspace for a new employee or a whole new department without delay. Greater Ergonomics: With a standards program that sets a minimum requirement for ergonomics, you have the potential to reduce repetitive stress injuries in the workplace. Better Branding: All office furniture can be standardized to fit the color scheme or “look and feel” for your business – even across multiple satellite locations. More Productivity: Furniture is selected based on how well it supports the types of work actually performed within your organization. Extended Lifespan: Office furniture that is standardized can be reconfigured or added to with ease allowing it to be functional for longer. Less Administrative Hassle: When a policies are in place for how office furniture is allocated and who is responsible for each step (approval, purchasing, installation), there is less chance for confusion and redundant work in the provisioning process. Higher Employee Satisfaction: Employees don’t feel that some workers get special treatment when it comes to office furniture. Standards are open, transparent and fair. Why Choose a Local New Orleans Office Furniture Dealer? We know there are hundreds of retailers trying to tempt you with online deals. Why does it make sense to go with a New Orleans office furniture dealer to outfit your local business? The most obvious reason is that you can access on-site planning services. No matter how up-to-date you think your facility blueprints are, there’s nothing like a real walk through to figure out how the space actually works. This hands-on approach makes it possible to identify ways to maximize the available area. For example, you might be very surprised to find out that you have dozens of square feet of space (or more) that you haven’t been using to its full potential. That’s like finding “magic money” for your business. Having a second set of eyes appraise your location also helps you avoid obstacles that could increase the costs of your office furniture purchases. For example, you wouldn’t want to buy a conference table that looks great in an online ad and then find you can’t maneuver it through the hallway or door leading to your conference room. We pay attention to all the little details during the selection process so you make choices that fit your office (literally). An in-person planning session also provides you with an opportunity to present your company’s workplace culture to a professional consultant. When your office space planner understands your business and the people who work there, they can help you brand your business accurately. Branding doesn’t just make a good impression on visitors or customers. It can be carried throughout the work space to help boost morale. For example, ergonomic touches serve as practical reminders that you believe in your mission statement that says your company cares about its employees. Everything from the shape, texture and color of your furnishings gives your office a cohesive look and feel. Buying a piece here and a piece there online means nothing ever really goes together. At the same time, you don’t want to be restricted to buying only one brand just to stay on theme. You need to be able to mix and match with confidence. That takes an in-depth knowledge of the available manufacturers and their product lines. We bring that knowledge to the table with decades of experience in the office furniture industry. 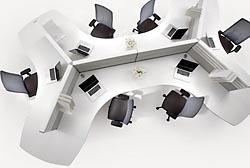 During your consultation, we help you select office furnishings from trusted manufacturers with a reputation for excellent workmanship and high quality materials. 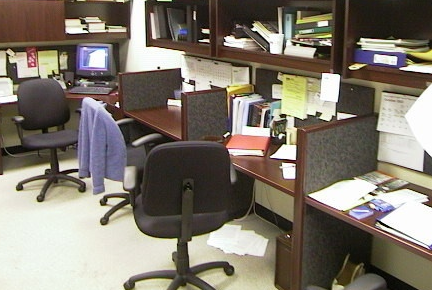 However, the workplace environment can take a toll on even the sturdiest office equipment over time. That’s why it makes sense to hope for the best but plan for the occasional maintenance call. Perhaps you have a warranty issue that you need resolved due to unexpected failure of a component. Maybe an employee somehow manages to damage a piece of furniture in a way that voids the warranty. You don’t have to worry about figuring out which vendor you bought the piece from or shipping items back to the manufacturer with all the hassle that entails. We’re the people you call to replace or repair your office furniture. If you stay in business over the long term (and we certainly hope you do), things are going to change. You might move to a smaller office to take advantage of lease savings or hire additional employees you want to squeeze into your existing office space. This means you need to figure out how to fit your office furniture into a smaller footprint without sacrificing comfort or productivity. Sounds like a job for The Office Planning Group! Or, you might be moving to a larger space and increasing your headcount. 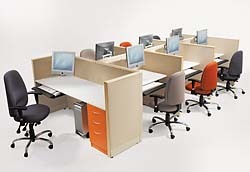 You don’t want to start over with all new furniture if you can just add more workstations of the same type. That’s easy when you can call us to plan, purchase, and install more pieces that match what you have in place. We build modularity and flexibility into your office design from the start because we plan to be there for you as you grow!